Fender Esquire Model Solid Body Electric Guitar (1964), made in Fullerton, California, serial # L28193, Blonde lacquer finish, ash body, maple neck with rosewood fingerboard, original blond tolex hard shell case. OK, we've seen a lot of Telecaster family instruments but here's a rare one-a 1964 Fender Esquire, something we have actually never had before. Although the "Esquire" name had been around since 1950, applied to the single pickup variation of the Broadcaster/Telecaster, by the early '60's the model's popularity was in a steep decline. While the Esquire was classed as a separate model it was just a single-pickup Telecaster (built from all the same parts) which allowed Fender sales to offed a slightly cheaper alternative for the buyer who couldn't quite spring for the Tele's $189.50 pricetag. By 1964 the "plain Jane" Esquire was lost among the myriad of newer Fullerton models both more and less expensive and was only ordered in miniscule numbers. This guitar is one of those, and a stunningly well preserved one at that. The features are mostly the same as a period Telecaster, but of course with only that blank spot on the empty-looking pickguard where the neck pickup usually sits. The neck is actually dated October 1963, but the pots carry a code from the 10th week of 1964 indicating assembly in the spring of that year. The guitar shows a typical mix features for this period. The old single ply white plastic pickguard (used since 1955) is still present with a few more edge screws than in the '50's, as is the old script Fender logo decal used up into 1968-indicating a lag of older parts in stock for this now-scarcely built model. 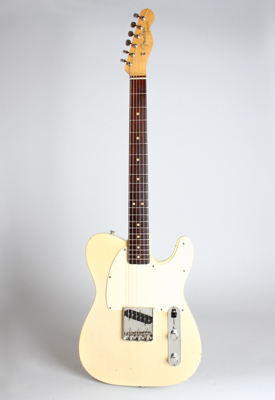 The grainy ash body has a slightly yellowed coat of the typical 1960's "white-blonde", which is still semi-transparent. The neck features the clay-dot inlaid rosewood fingerboard and the standard round/flat 1960's Fender profile. The "Fender Patent" bridge unit carries three serrated saddle assemblies and a single staggered pole piece pickup controlled by volume and tone knobs and 3-way switch with a "top hat" tip. The Esquire wiring is unique in offering three tonal options: the #1 bass-heavy setting, the #2 with a normal tone control function and #3" "bypass" sending the signal straight to the jack. This last setting is the Esquire's secret bonus, offering some of the finest, snarliest tones ever to emerge from Fullerton. The serial number stamped on the neck plate is a classic early "L-Series" for 1964, the last Pre-CBS year at Fullerton. This is fantastic sounding guitar-especially for having just one pickup-bright but not thin, twangy with bite and body. A super Fender rarity that's also a joy to play…and even to just hold! This no-frills Esquire remains a fantastic example of stark Fender minimalism, and in that light one of the coolest of Leo's children we have seen in a long time! Overall length is 38 3/4 in. (98.4 cm. ), 12 3/4 in. (32.4 cm.) wide at lower bout, and 1 3/4 in. (4.4 cm.) in depth, measured at side of rim. Scale length is 25 1/2 in. (648 mm.). Width of nut is 1 5/8 in. (41 mm.). Usually this process of describing a vintage instrument of necessity ends up being a litany of everything unfortunate that's happened to it since the day it first came out of the case, shiny and new. Well, this one's got some light checking, some typical small dings to the very thin Fender blonde finish (mostly on the edges-the Telecaster syndrome) and a little fretwork on the crowns in the lower positions. And…that's it. ALL original, NO modifications, NO bonehead "improvements" just bona-fide Fender goodness from the days before the company was sold into corporate slavery. The snap-on bridge cover is gone but the amazingly clean white Tolex case (with a cool '70's vintage store sticker on the top edge) and the super rare original hangtag/instruction manual are still present. Simply a wonderful guitar-the sound, the feel, the vibe are all the most basic and pure of Fender nirvana. Twang it and be blessed! Excellent + Condition.